These blissful moments like these, however don’t come easy, they must be earned. I had to drive approximately 80km out of the city, kayak through white water rapids, and brave holding my breath underwater, upsidedown…but it was all worth it. Sometimes, you need to go a little further, do a little more, get out of your comfort zone to get to those transcendent hidden pockets of nature. This, was one of those places. So how did I end up floating down the River Nile on a Saturday afternoon? 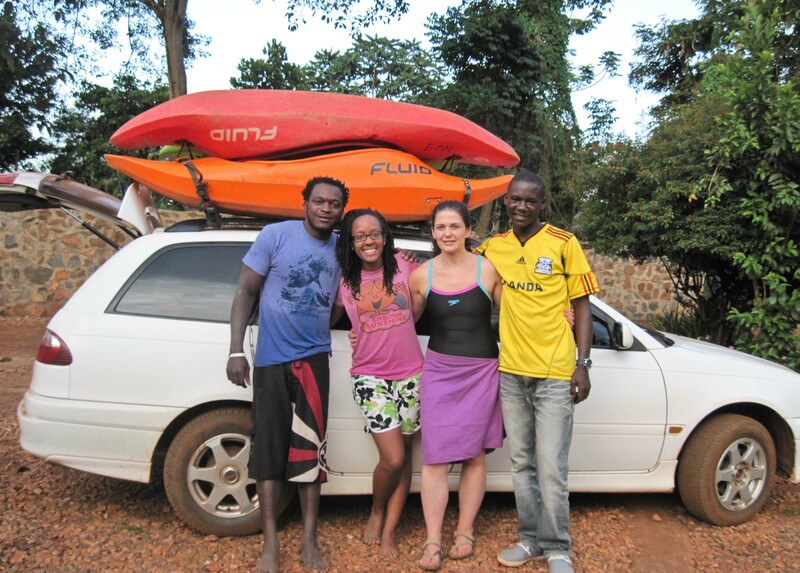 Well, 13 days ago I signed up for a Kayak trip organized by Mountain Club Uganda and Kayak The Nile. 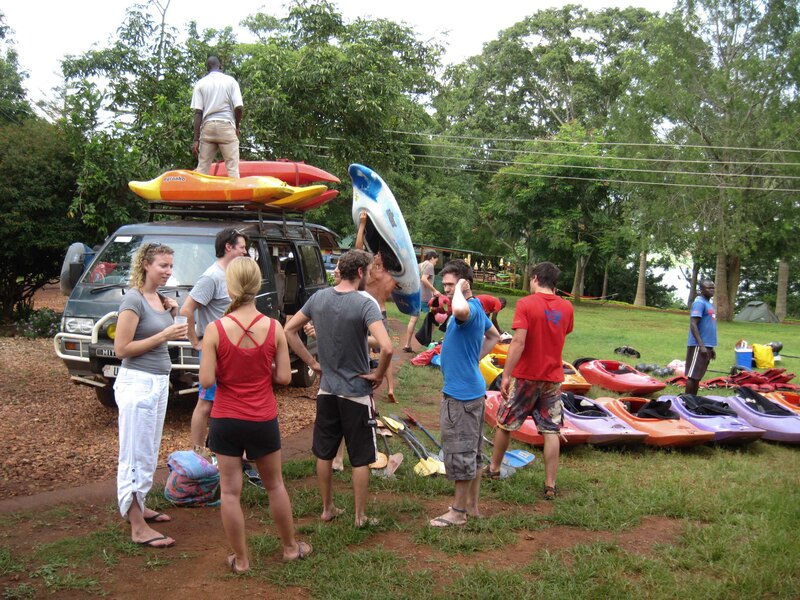 The proposed trip was to drive out to Bujagali, in Jinja, and take a full day introduction lesson on white water kayaking, spend the night at Nile River Explorers River Camp, and return to Kampala on Sunday. I’ve Kayaked before, but I’d never been taught how to do it properly. Usually, I just rent one out when I’m at the beach, or lakeside, paddle about, usually going in circles for most of the time, so I was definitely interested. I love most watersports and I was actually excited about kayaking through rapids and waves! I left home at 5:50am, unusal for a Saturday morning, but I was rewarded by getting to watch the sun rise, and clear traffic free roads. I meet up with some MCU members at Nakkumat Oasis mall at 7:15am and we all got on the free Nile River Explorers shuttle bus. However, like most buses in Uganda, we ended up setting off almost 2 hours later. Turns out the bus had been over booked, and we had to wait for it to be sorted out. 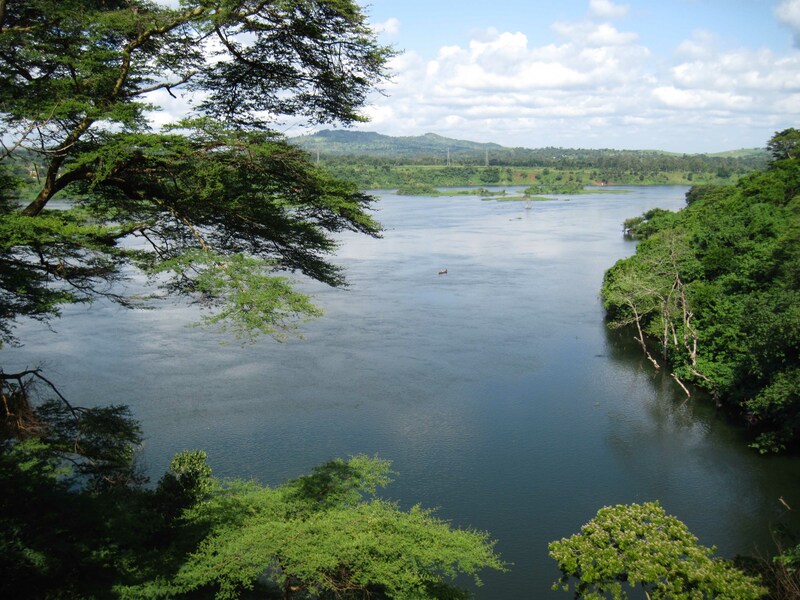 Once we got to the Nile River Explorer Camp, we immediately picked out our equipment, changed into our wetsuits, signed the “its-not-our-fault-if-you-die” forms, dumped our bags at the main office and hit the river! 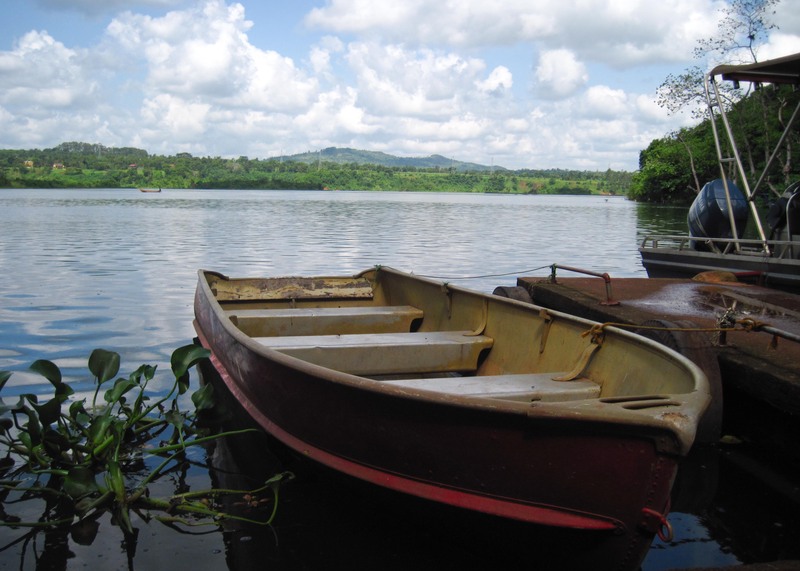 We practiced at a bay of sorts, on flat water, with lush forest along the banks and an audience of Vervet and Red Tailed monkeys. We learnt how to strap in and pull out of the kayak incase we capsized, (its much easier than it sounds once you get over the fear of being upside down underwater), the proper way to paddle, how to carry out a T-rescue and a Roll. As we were practicing, our audience got into a territorial fight and a baby Red Tail monkey fell into the river. I never thought monkeys could swim but this little guy made it all the way to the otherside of the bank. Although we didn’t get the hang of a T-rescue, our instructor managed to rescue the baby monkey and helped him out of the river with his paddle. 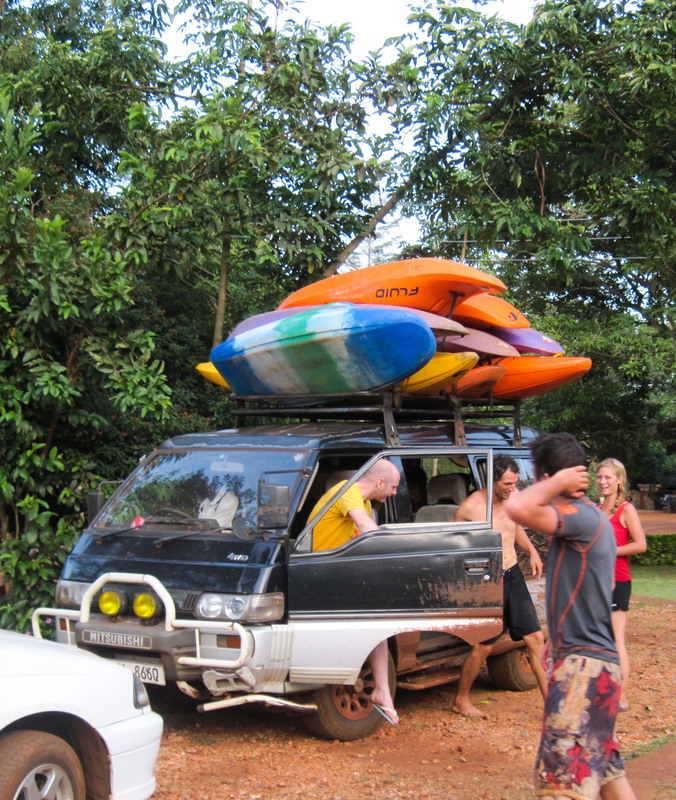 After a few hours of practice, we got out, had a quick lunch break, loaded up the Kayaks on cars and head off for the real thing. How many kayaks, do you think, can be strapped on top of a car? Our 8km kayak trail started just after the Bujagali Dam, which we could see towering over in the background. The surrounding village kids raced the cars down to the banks and helped off load the kayaks and line them up at the bank for a mere 500 shilling coins each. We geared up and pushed off. But before heading down stream we practiced how to get in and out of the eddy. When we initially set off, I must admit, I was a little anxious. The current and undercurrents moved fast, and swilled haphazardly, sometimes causing whirlpools that could easily capsize the kayaks and where difficult to paddle out of. However once you go through the first few sets, you start looking forward for the next and you wish you had more at the end of it all. There is a particular set that capsized many, but I proudly managed to paddle though; they call it Jaws, and its easy to see why when your faced with a meter’s swell of waves that crunch down on you from all directions. It was such an adrenaline rush, the kind you sort of end up screaming your way through without even knowing it! At the end of the last set of rapids, the instructor, fellow newbie and I, discovered we were the first group to complete the route. So we took a break, pulled our sprayskirts off, laid back and relaxed into that blissful moment. Everything slowed down, after the focused tunnel vision from adrenaline rush, and the river suddenly seemed so wide. It felt like we were in a lake. I was definitely on a natural high, I don’t know how long we floated down stream, but everything felt and looked so vibrant. Our finish line was marked by a Fig tree on the river bank, and once we drifted near it we paddles back to shore, where a crowd of village kids had already assembled to welcome us back. The helped pull the kayaks out and we waded through the mud up the slope to where the cars were parked. Our instructor then opened the trunk, pulled out a cooler packed with cold beers, of which he handed to us, and we cheered to our success of having survived kayaking through Jaws and having thoroughly enjoyed it. I don’t usually like beer, but this particular beer was the best beer I’ve ever drank. The sweet taste of a challenge successfully completed. We sat at the top of the slope, curious children watching us, and waited for the rest of the group to catch up. During the wait, I watched happened to witness some of the villagers led a massive cow to the riverbank, get into a canoe and pulled the cow along, as it swam skillfully across the deep, moving river. Even more impressive than that monkey! 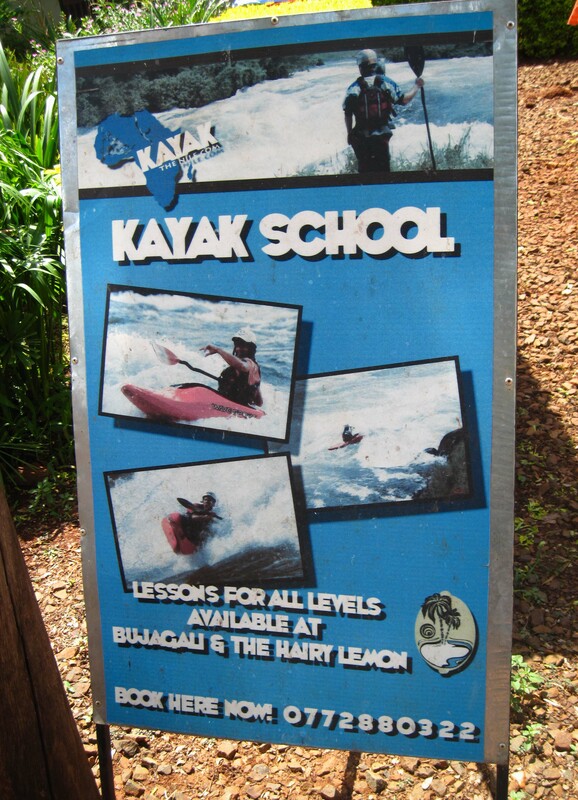 Not only did I learn to kayak but also learnt that Monkeys and Cows can swim, surprisingly well! Back at Camp, I decided to sacrifice a hot shower and go for a shower with a view instead. 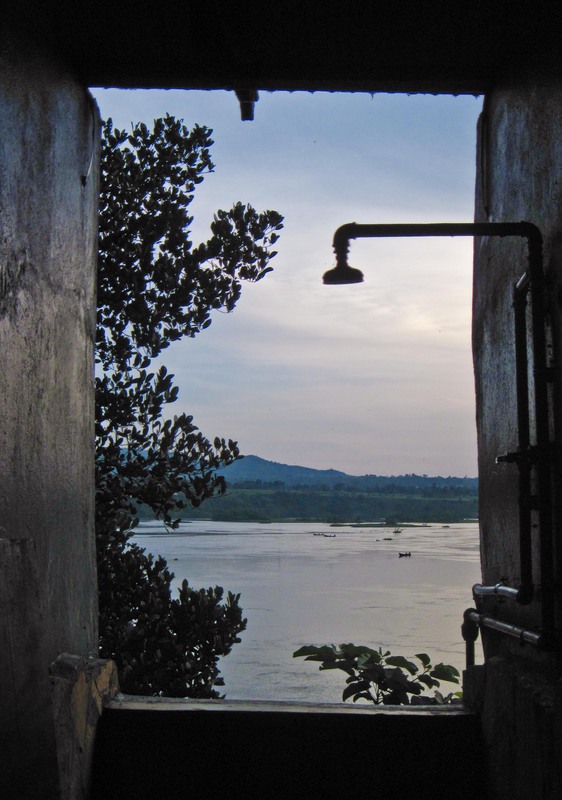 I’ve never enjoyed a cold shower like I did that day, watching the sun set, with silhouettes of canoes drifting downstream. By dinner time, I was starving, a sign of a day well spent. 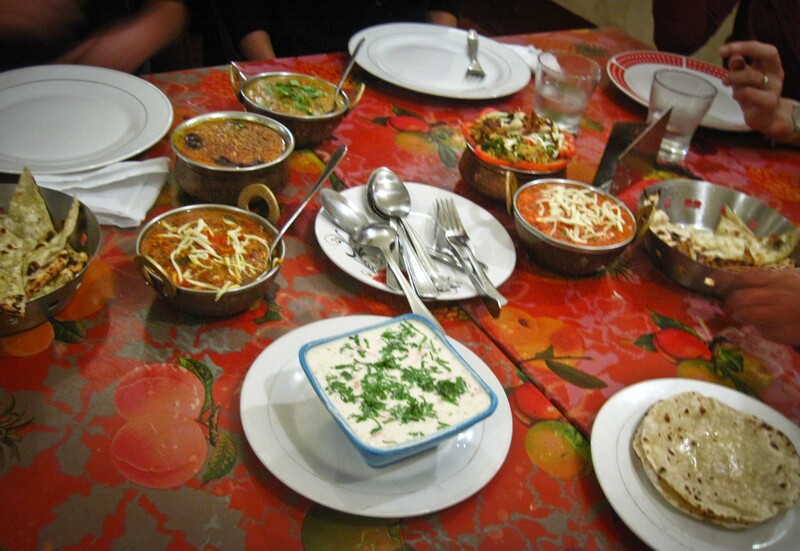 A friendly Australian couple that was familiar with Jinja town suggested going to a restaurant in town that served what they claimed to be the best Indian cuisine in the world. 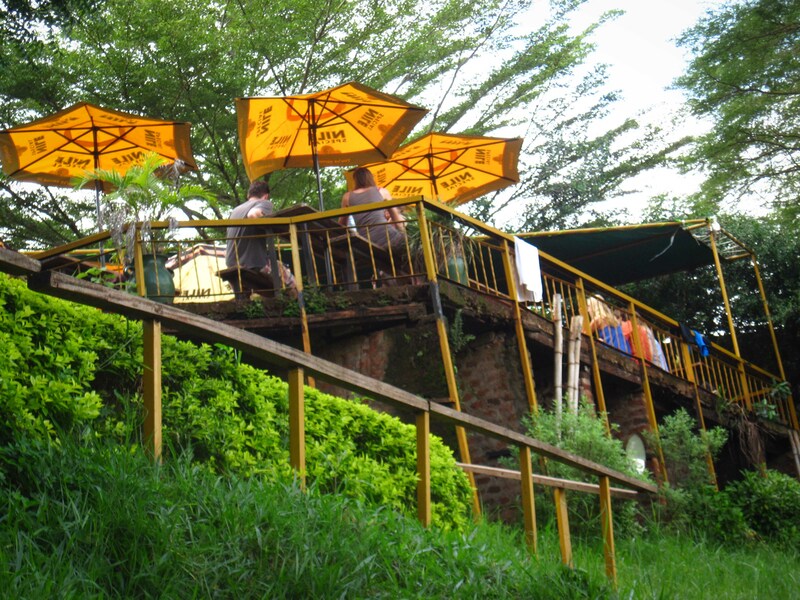 A group of us hopped into their car, which can’t reverse, and went the only way it knew how, Onwards, into Jinja Town. Despite the awkward name, and inconspicuous entrance, Aswald did infact have some amazing south indian cusine, the smell of which draws you eargerly in the moment you step foot into it. We ordered dozens of dishes with exotic names, all vegetarian, all absolutely delicious and we stuffed our faces. We ate such a huge variety of food, and yet ended up only paying 12,000/= each for the whole meal! Nothing beats good food that’s also cheep! From the hasty way this photo was taken, you can see how eager I was to dig in! By the time we got back to camp, the party was just warming up, but I didn’t last very long. Within the hour I decded to call it a night. 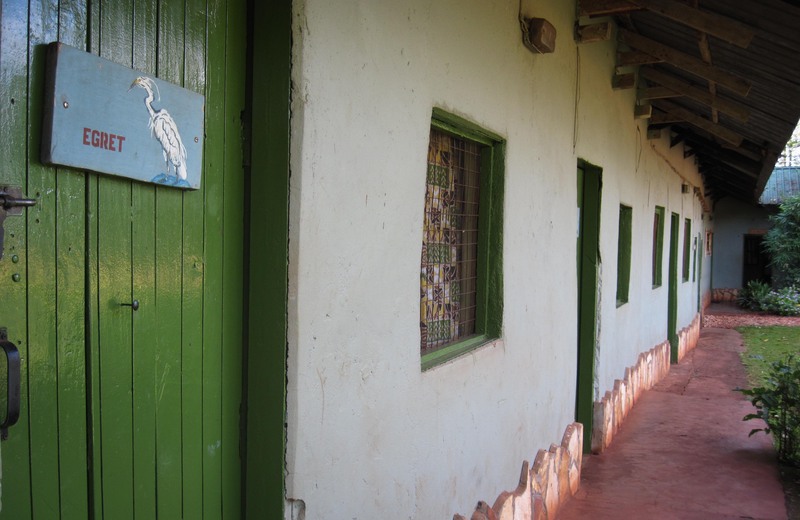 I walked back to the Egret, (the dorm room I would be sharing with 5 others), climbed up to my reserved bunkbed and was asleep before my head hit the pillow. 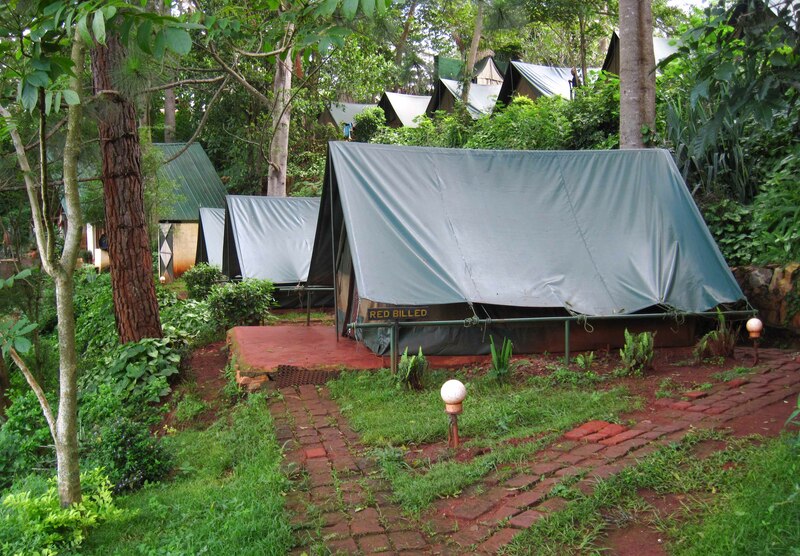 Basic accommodation, but more than adequate after a long day of kayaking and all you want to do is sleep! Not surprisingly, my body ached in the morning, and after a long awaited breakfast, I joined a group of 4 others who had also decided to head home early. We got a bus from Jinja town for 6,000/=, which also took ages to set off, and headed back into Kampala in attempt to savor the remaining Sunday evening, enjoying the creature comforts of home. What did you do on the weekend? If you ever up for an adventurous weekend away, that’s not too far from town, you must try white water Kayaking. If I can do it, you can too, really, why should all the muzungu’s have all the fun! Get in touch with the Kayak The Nile team, they’re very friendly and they know what they are doing, they actually coach the Great Britain Freestyle Kayak team, and hold World Class champion titles too. If you need even more convincing, check out this video, created by one of the MCU members on a previous Kayak trip. Go ahead, try it. You may very well find me back there again! 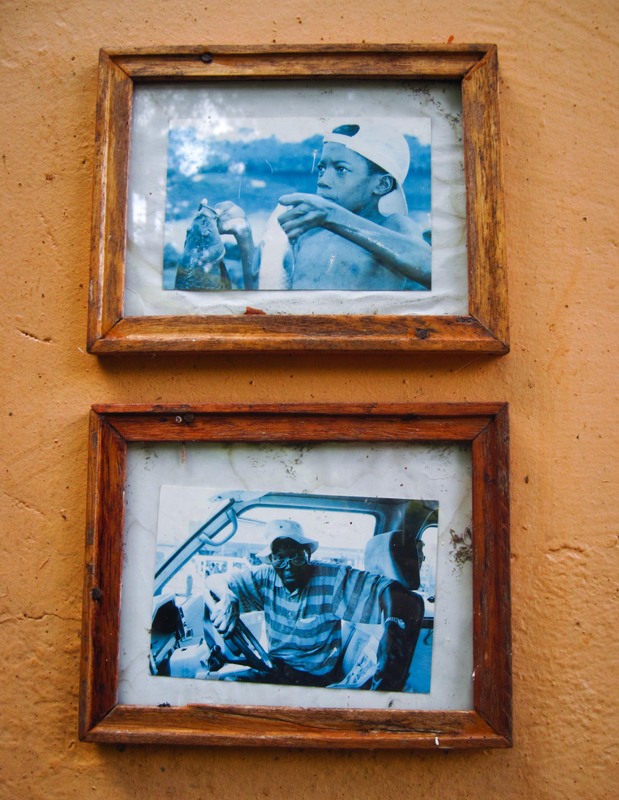 Rustic photograph’s of the life and people around Bujagali. Awesome! I’ve been meaning to do one of these trips for ages. Ach. I am always too late on the uptake :(. Squeal! I began reading this article a long time ago, but I don’t think I finished it because there are pics I feel like I’m seeing for the first time. By the way, your first sentence was in my head when I decided to go zen tubing.